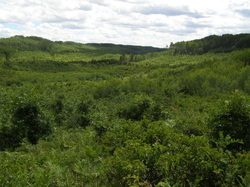 The Upper Midwest was once covered in vast stretches of oak savannah that produced an incredible bounty of fruits, nuts, and game. At the American Hazelnut Company we are working to restore that amazing biome by producing and selling one of the treasures of the oak savannah, American hazelnut. Our products are made with nuts from American hazelnut or hybrids with European hazelnut, a close cousin. Fruits and nuts are key to a healthy diet and what better way to eat healthy while restoring our environment than by eating nuts from plants native to the region. 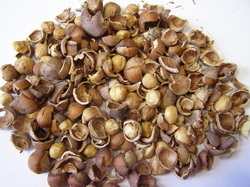 If you've ever eaten a hazelnut (filbert), it probably came from Corylus avellana (European hazelnut). The kernels from American hazelnut and hybrids with European hazelnut are smaller, but tastier. Our nuts are perfect for baking, confections, granola, cereal, trail mix, and just about any other product you might make with hazelnuts. Oil from hazelnuts is truly heart healthy with 80% oleic acid, the same fatty acid that makes olive oil so healthy. In fact, hazelnut oil is just as healthy as olive oil, but has that subtle nut flavor that chefs adore. Roasting hazelnuts brings out the full flavor.